My weekend's been quite good so far (given that I've not managed a lay-in for 3 weeks, parenthood has definitely reprogrammed my body clock! 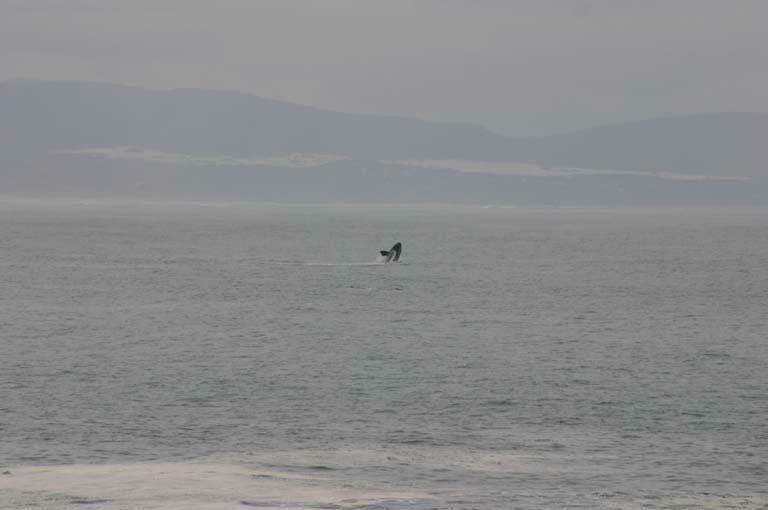 ), on Saturday morning I went to Hermanus on my own, the weather here at home was gorgeous, not a cloud in the sky (maybe Spring has sprung?) but as I drove over Sir Lowry's Pass the fog (cloud) was really dense and once through that it was quite overcast. 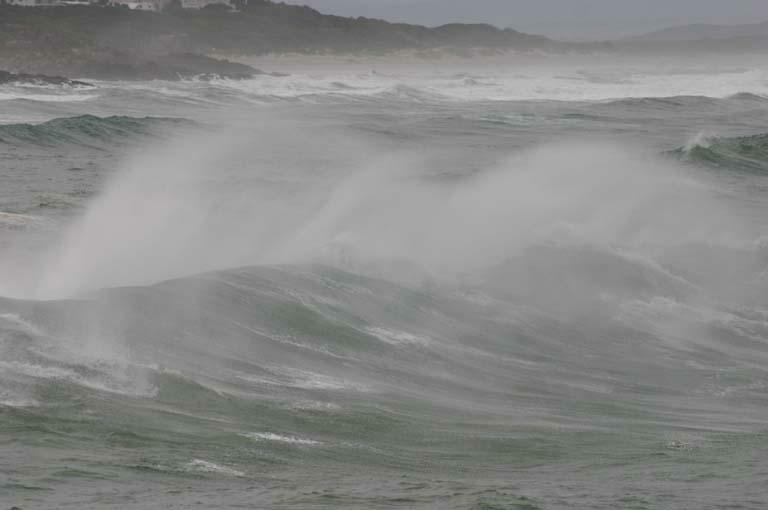 I arrived in Hermanus early morning and stayed for 3 hours and took 321 photographs (I've managed to whittle them down to 7 which are posted below). 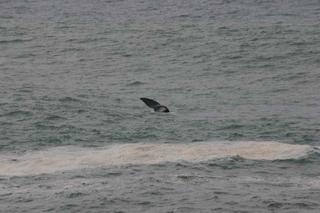 The whales were abundant but due to the weather and a 3-4 metre swell they weren't performing as much as they can. 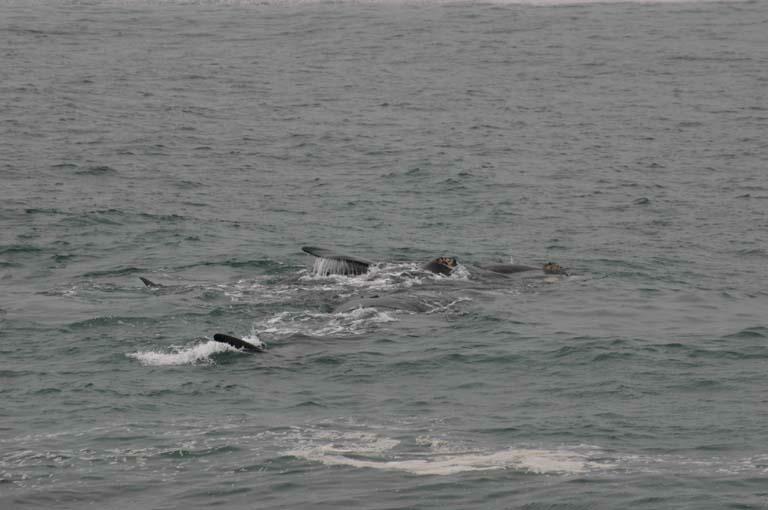 Thankfully as the morning wore on the weather improved and by 11am the whales were up to their usual tricks. 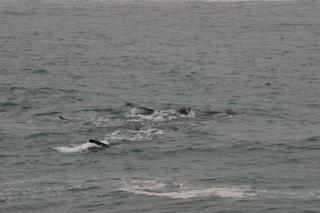 At one point, 4 or 5 whales swimming together came within a few metres of the shore which was really cool! See photos below. This afternoon I took my kite onto the fields in the park and had a laugh flying it. The South-easterly wind is back and is blowing at an average of 40kph so it was quite steady for the kite. The best trick with the kite is to traverse the horizon with it and let the dogs chase it, then just as they think they've got it you suddenly turn the kite the opposite way and traverse the horizon again. The dogs are so stupid they will chase the kite for ages getting totally exhausted. It amuses me anyway! Tomorrow is Sunday which means it will be less than 24 hours before Paula & Joel will be home!!! Tomorrow I'm having dinner with our pastor and his wife (Francois & Liz) which I'm really looking forward to. Francois is a fairly typical Afrikaner and has an odd sense of humour (displayed by his support of Charlton Pathetic), thankfully Liz is a Zimbo so she counter balances him perfectly! It should make for a very pleasant afternoon. When I checked email this afternoon (I was actually checking the football scores - see below) I received one from a guy called Paul in Holland, he has a Blog called: Panda's Ponderings and has put some stuff from our Blog onto his, which is cool! Please check out his Blog, it's very good. Palace were playing at home this afternoon and chalked up another victory beating Hull 2-0. Next match: Reading away, Tuesday 13th Sept 8pm. 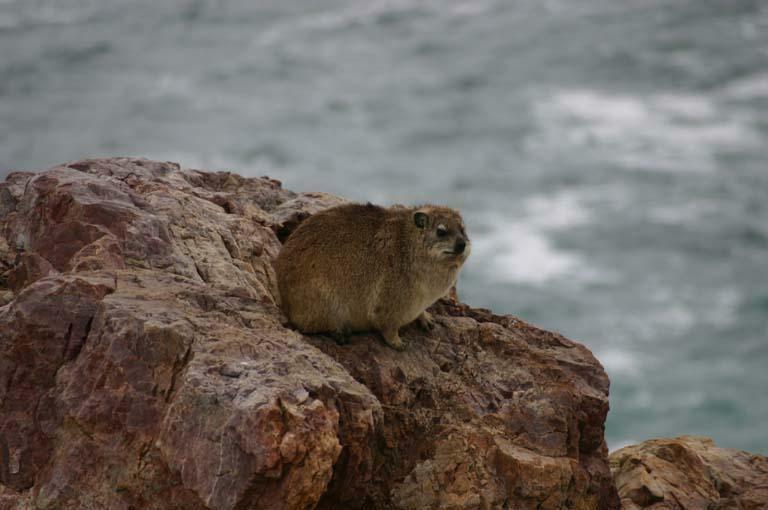 This is a Hyrax or Dassie, apparently the closest living relative to the elephants. 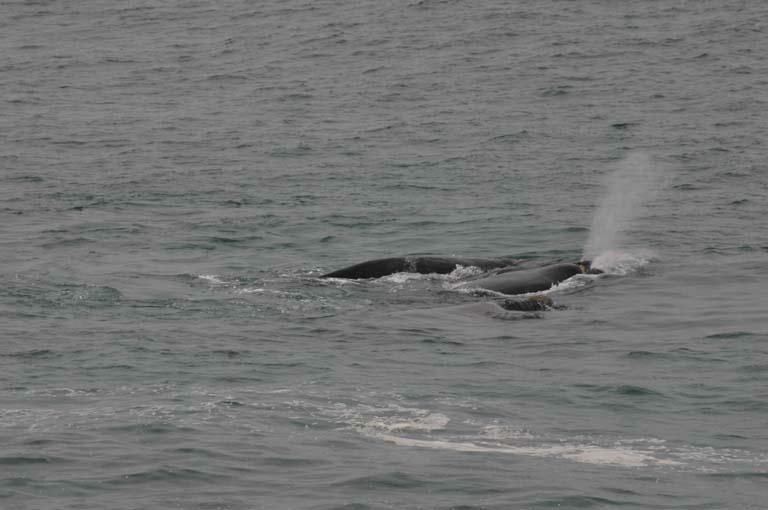 They were in abundance on the rocks as I was waiting for the whales to start performing. 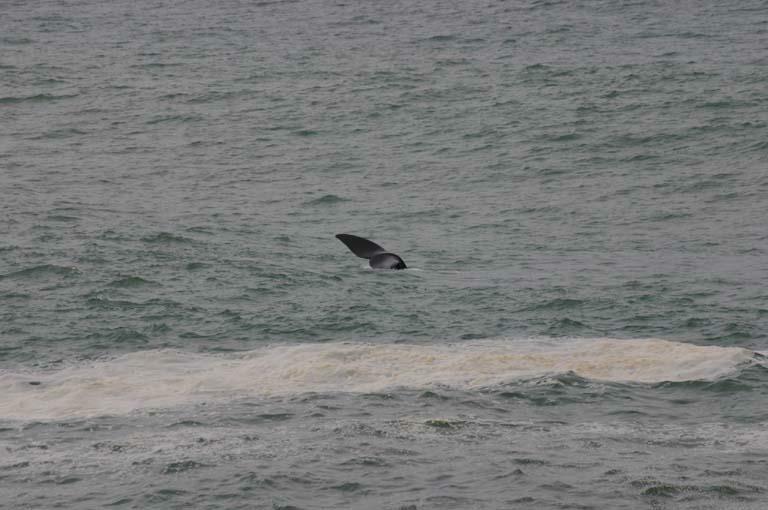 As you can see the swell was quite large and the wind was blowing vigorously, unfortunately this puts the whales off. 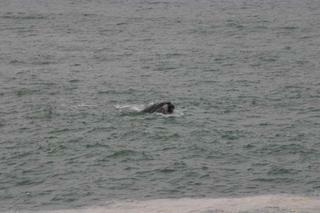 Spyhopping is when a whale just pokes his head out of the water without actually breaching. 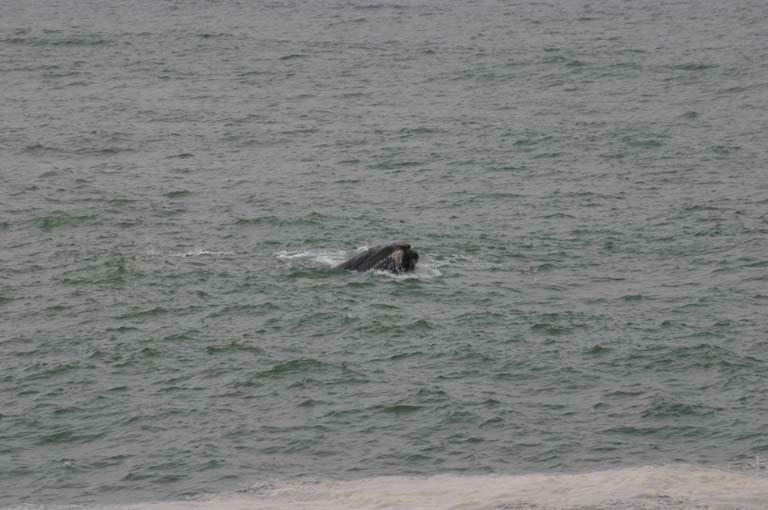 Apparently whales have good eyesight out of the water. I can count 4 definitely, but this group was bigger than that. 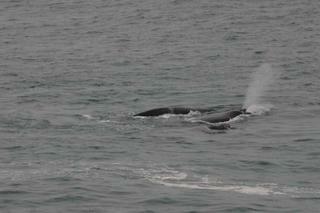 They were only a few metres from where I was standing. A truly spectacular event! This one is quite far out but even so, it's still impressive. 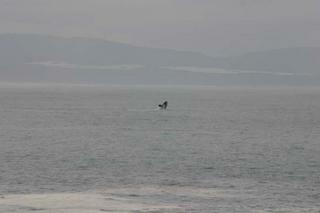 Sailing, this is when the whale is upside down in the water just sticking its tail out.